Great for large volume of bottled beverages. 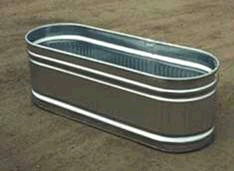 Galvanized corrugated sidewalls and 20 gauge tank bottom. Size 2' wide x 2' deep x 4' long; capacity 103 gallons. * Please call us for any questions on our cooler tank oval galvanized 4x2x2 foot t rentals in Ft. Wayne IN, Warsaw, Syracuse, Auburn, South Bend, Indianapolis IN.